Name: Amattia Acrylic Freestanding Soaking Bathtub 69"
This stylish acrylic modern bathtub comes fully equipped with an over flow, pop-up and drain while its sleek edges round into corners to bring your eye around the entire modern silhouette. The streamlined border incorporates the perfect shape that is attributed to modern acrylic bathroom design without neglecting form, function and practicality into your bathroom home decor. 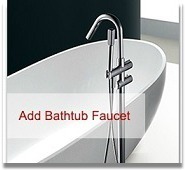 This incredible freestanding bathtub design will add trendy elements and elegant appeal to any bathroom decor. The Amattia freestanding bathtub will be the perfect addition to your bathroom as you bask in the comfort and relaxation it provides.